Chanel Dubofsky discusses Yvonne Brill’s ridiculous obit in The New York Times this weekend, and shares how she’d like to be remembered. I have not been to a lot of funerals. The ones I have been to, though, have been for the two women who raised me, so I was paying pretty close attention to what was being said by the people who performed their eulogies (I was one of them). At my grandmother’s funeral, I sat in the front row next to my aunt and uncle and looked at the small casket and listened to the rabbi say the most generic thing you can imagine: she loved life. She had 96 years, but if you walked into that funeral off the street, it could have literally been anyone in that box. 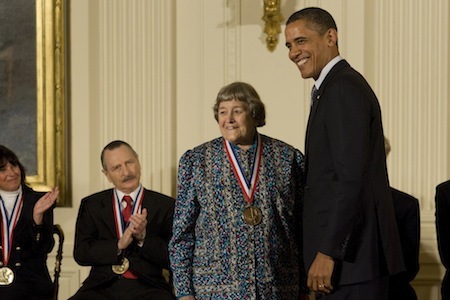 Last Wednesday, Yvonne Brill, a rocket scientist who received the National Medal of Technology and Innovation award in 2011, died at age 88. Her New York Times obituary (which has since been altered due to people causing a ruckus) opened with the following sentence: “She made a mean beef stroganoff, followed her husband from job to job and took eight years off from work to raise three children. ‘The world’s best mom,’ her son Matthew said.” The edited version, as far as I’m concerned, is also not that great; it still references her following her husband “from job to job” and taking time off to raise her kids in the first line. A friend of mine and I have had conversations about what I want done with my journals when I die. (This talk usually precedes my getting on an airplane.) The answer is that, as of right now, I want them buried, and not made accessible to others, because in those books, which I’ve been keeping loyally since I was 11 years old, I don’t censor myself. People could be hurt by the contents. They could also be delighted by it, but the point is that it’s my words, my space, and it should remain so. Suggested notes for my obituary/eulogy: I was a deeply private person. I was complicated. I needed a lot of time alone, which might have made people think I was a hermit, and that wasn’t completely untrue. Also, my handwriting was hard to read. There will be no “she loved her children,” because there will not have been any children, and you can say that I knew there never would be, because children were never part of the life I wanted. You can say I fought hard for the life I had, that the most important things in that life were writing and justice and freedom of movement and thought and making my own road. You can say I made other people uncomfortable and angry and that I wanted to do that, I wanted to shake people from their complacency and assumptions and safety. You can say anything about me that you ever thought was true. I don’t care. (Hey, I’m dead in this scenario.) But please, please, don’t be generic. Go deep, or at least, deeper. You don’t have to make me look good. Just make sure the world knows I was here.